NFL quarterback Peyton Manning explains to the IBM Pulse 2013 audience in Las Vegas the importance of effective decision making, in football and in life. Peyton Manning has earned his way into NFL history, playing for the Indianapolis Colts for 14 seasons before making his way west to the Denver Broncos, where he had to learn a completely new playbook and offense. The backstory: After undergoing extensive neck surgery in May 2011, he was forced to miss the entire 2011 season with the Colts and was released in March 2012, at which point he visited with and worked out with several NFL teams during a two-week period before settling on the Broncos. 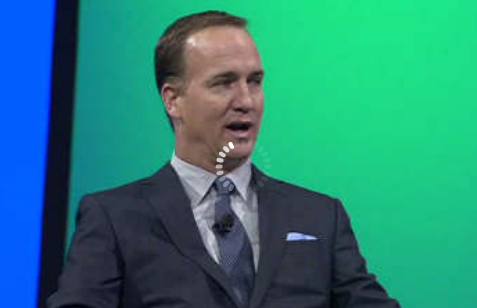 Along the way, Manning developed his own personal playbook for cultivating leadership and effective decision making, the points of which he shared in the IBM Pulse 2013 day three general session. But unlike most people, Manning explained, “my decision making is instantly judged by 80,000 fans in the stadium and millions on Twitter” — and that he wouldn’t have it any other way. But to get to that level of confidence, Manning explained, it requires an enormous amount of preparation. Days of practice, of watching and analyzing game and practice film on his iPad, talking with his teammates. After his injuries in 2011, Manning related that “I’ve learned to savior what resilience can do for people.” His first pass after his rehabilitation “went literally about ten feet,” and he explained “it’s hard for most people to understand the magnitude of changes and the elasticity needed” after such an ordeal. Perhaps the Super Bowl should have blackouts more often. I thought I was going to fall asleep near the end of the first half, though Beyonce and her friends most assuredly would have awakened me from my slumber at halftime. I don’t think she lip-synched that performance, and neither, it seems, did Ravens quarterback and MVP Joe Flacco, who actually threw for less yardage than San Francisco QB Colin Kaepernick, some 287 of them. But Flacco’s passes garnered a little bit more accuracy and a couple more touchdowns, so it will be he who rides with Mickey and Minnie in the parade at DisneyWorld this time around. As for the SuperBowl of advertising, well, let’s just say it was a year filled with fair to middling entries, some strong, most anemic, several childish but sometimes fun. With many of the ads, I got the feeling I was watching the Mike Judge SuperBowl Advertising Film Festival, with a little bit of Sundance throw in for good measure. For my money — and in the end, that IS what advertising is all about, getting you to spend your money — the Ram truck ad featuring the still life images of farmers and ranchers, underlined by the voice of heartland radio commentator Paul Harvey, walked away with the gold. Turns out Richard could have used a shovel instead, as his remains were recently discovered underneath a parking lot in the English midlands city of Leicester. What’s even more fascinating, DNA evidence linked with modern ancestors proves the genetic link. It also turns out that Richard’s body did, in fact, have the historically anticipated hole in his head after all, having been struck by a medieval halberd (think pole ax), along with a scoliated spine. According to The New York Time’s story, the University of Leicester plans to rebury Richard’s bones in the Leicester Anglican cathedral, and that the reburial will likely take place as part of a memorial service honoring Richard as an English king sometime early next year. Not to worry about those Tower of London plots where he schemed to have his nephews killed way back when. That’s water under the bridge! Wait a minute, you might be saying to yourself, how in the world did they find Richard beneath a parking lot in Leicester in the first place? Ground penetrating radar, of course! This is a technology blog after all — why else would I be bringing up Shakespeare and King Richard!? In any case, truth in this case is definitely stranger than fiction, and the fiction was pretty strange to start. Well, I could hardly let a near milestone on the PGA Tour go unnoticed from yesterday’s opening round of the Waste Management Phoenix Open, now could I? Golf fans everywhere, Phil Mickelson is back…well, at least he was yesterday, and it was both sporting triumph and heartbreak rolled all into one. If you remember Phil’s play from last week out in Torrey Pines, which could be hard to do considering how low down on the leaderboard he was…well, let’s just say it wasn’t pretty. Phil’s driver seemed at times like it was poised to try and stretch his drives across the Pacific ocean, and playing from the wilds of the South Course is no fun, as those holes are long and difficult to reach when you’re playing from the middle of the fairways, never mind in from near the condos and office buildings sidling up along the course. But all that changed when Phil A) put a new driver in the bag and B) flew coach Butch Harmon in for a swing tune up. So yesterday, in Phoenix, where the crowds love to drink beer and act like they’re at a NASCAR race on the par-3 16th (It’s the only PGA stop I know of where fans actually boo the players if they miss the green on their drive! ), Phil brought his new driver and swing and attitude to town! It went a little something like this: Birdie, Par, Birdie, Birdie, Par Par, Birdie, Par Par. Then, the back nine went like this: Birdie, Birdie, Birdie, Birdie, Par, Par, Birdie, Birdie, Birdie. Only, it actually went that way in reverse, because Phil shotgunned his start on the 10th tee. So here’s where the drama comes in: On hole 8, he needed one more birdie and then par to shoot a 59, something only five other golfers have ever done in PGA Tour history in a professional round. And, if he birdied 9, he would have shot 58, to my knowledge, a first in Tour history. He gets to 8 in 2 shots, and has, I’m guessing, about a 20 foot downhiller with a slight left to it. He lines up the putt, strikes it, and the thing runs out of gas centimeters from the hole. So it won’t be his day for a 58, not unless he eagles 9. On 9, he once again gets it to the green in 2, and voila, now he has about a 25 footer that takes a little bit more left. He lines up, thousands surrounding the green, most probably clued into the history that might be made here…the putt’s off and on a gorgeous trajectory to the hole…it comes along the right side of the hole and decides to make a U-turn at the very last second, gravity pulling it against the back of the cup and back around the other side and…up and out of the hole, again centimeters away from the hole. The golfing gods can be so, so incredibly cruel. It was as if you could hear Zeus roaring down with laughter from up the road in La Jolla. Phil’s longtime caddie, “Bones,” fell to the green on his knees, ready to sacrifice himself to the great “Caddyshack” gods in the sky to make that putt please, please, please roll back into the hole. After the round, the Golf Channel correspondent interviewed Phil, and you could see the pain in his eyes. Yes, of course, he shot a 60, something golfers also don’t get to do very often (and which, I can assure you, I’ll never do, unless it’s on the front nine)…but, that special personal victory was oh so close, and yes, Phil answered, he knew within the first few holes on the front nine there was something special in the air, and that he could well be on his way to a record round. Phil continues his lead today at 14 under as of this writing, and if it keeps this up, nobody can touch him. But boy, what he wouldn’t do to have one more shot at that putt, and the PGA Tour history books. Myself, along with a lot of other Austinites, learned quite a bit about Formula 1 racing over the weekend. Though I didn’t get out to the track myself, I watched the entire race on TV. Of course, I also did a bit of research leading into the race, and also interacted with some experts via social media during the race, which made the experience all the more helpful. My general impressions are wow, those are some bad *** cars! What really struck me about F1 was the “Formula,” where the tinkering with the cars is limited mainly to that, so the focus is instead on strategy and tactics by the “constructor” crews and the drivers themselves. One tank of gas, two sets of tires, the track (in this case, the “Circuit of the Americas”), and your pit strategy. That seems to me to equalize the competition in a way you don’t see in every sport, making the viewing experience that much more compelling. 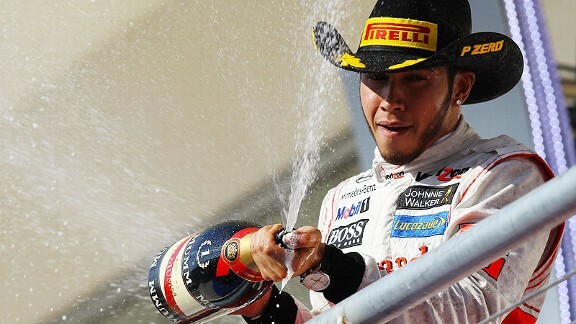 Lewis Hamilton from the U.K. took the top of the podium, forcing Sebastian Vettel to wait until the 20th and final race of the season to determine whether or not he’ll go “back to back to back” and win three straight F1 championships. As for Austin’s ability to host an event of this size, so far, the reviews are pretty flattering. We were expecting over 200,000 people over the long weekend, and despite the expected traffic challenges, the event went off quite smoothly. The virgin track certainly had some gripping challenges, but that actually made for a more scintillating race, and certainly didn’t keep the drivers from doing some aggressive passing. And the weather was simply perfect. To my mind, it really starts to cement Austin’s reputation as an “international” city, and I’m looking forward to our hosting future races. As for me personally, it’s official: I’m a converted F1 fan, and will be making it even more official by adding a new section to MyESPN home page! The memory of former Ryder Cup captain and player, Seve Ballasteros, was never further than the flap of the Euro teams’ golf bag in this weekend’s “Miracle at Medinah,” when the Euro team came back after a 10-6 trouncing by the U.S. on Friday and Saturday to retain their title and the Ryder Cup. Both sides celebrated Ballasteros’ life and contributions to golf throughout the entire week, highlighting the critical role the Spanish golfer, who succumbed to brain cancer last year, played in breathing new life into the once-every-two-year event and in making it “must-see” golf television. For true golf fans, this past weekend’s Ryder Cup delivered on its promise as the most exciting event in golf, and maybe in all sports. I wrote in this blog on Thursday that the Europeans had the advantage going into this year’s tournament, and boy did they prove it. After a weak start by the Americans on Friday morning, the U.S. team turned the tide on Friday afternoon in the fourballs, with Keegan Bradley and Phil Mickelson coming to life. After Saturday’s rounds, both foursomes and fourballs, the U.S. went into Sunday’s singles matches leading 10-6 — that meant they only needed to garner 4 1/2 points on Sunday to take the Cup back from the Euros. Euro captain Jose Marie Olafabal had other things in mind, including a similar 1999 comeback by the U.S. in Brookline when he was a player on that year’s Ryder Cup team. Hovering over the entire event was the spirit and memory of great Spanish golfer Seve Ballasteros, who tragically succumbed to brain cancer last year. 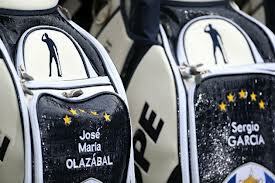 Ballastero’s image was imprinted on each Euro player’s golf bag, and the spirit of Seve’s commitment and championing of the Ryder Cup as a great golf event was pervasive on all sides. Ultimate, I believe it was that spirit that was channeled through and displayed by Olafabal’s European players. Ian Poulter on Saturday afternoon eked out a single point in a close match played with Rory McIlroy against Jason Dufner and Zach Johnson, demonstrating nerves of steel in his play and especially his putting. Yesterday, Poulter was at it again, beating U.S. Open Champion Webb Simpson 2 Up in a heated singles match. Justin Rose demonstrated sheer brilliance on the last three holes yesterday, sinking one unbelievable putt after another, matching Phil Mickelson’s also exemplary play stroke for stroke. Rose had mentioned in interviews this week that Seve Ballasteros had been a calming influence on him earlier in his career, assuaging him after he’d missed the cuts in a long run of tournaments several years back. No matter which side you were rooting for, this was definitely one for the ages, and my congratulations to the Euros on their holding on to the Cup — they earned it, and then some. I watched every moment of the tournament that was aired on TV — some 26 hours worth — and it was nerve rattling sport from the first tee shot to the last putt. You can refer to it as “Poulter-Geist” or “The Miracle at Medinah” or some other clever moniker. I’m just going to remember it as another great and dramatic Ryder Cup, and bite my lip while I wait a long two years for the next one. The first round of the TOUR Championship at East Lake was a doozy. Tiger and Rory paired together…well, it’s something special to watch. Reminds me of those transcendent rounds with Arnold Palmer and Jack Nicklaus playing together. Two of the best golfers in the world bringing out the best in one another, which mostly they did, and in the game of golf. Pure magic. Tiger finished at four under, his putting improving but also hitting some gorgeous drives and approach shots. Rory? Well, it’s his first time at East Lake, so now that he’s had a few runs around the course, watch out. He puts a few more closer to the pin and turns that putter on, and though he may not intimidate Tiger, he’ll certainly catch his attention. Rory’s been the strong weekend finisher this year, and the real question about Tiger is can he take that momentum from Thursday into today and the weekend? Phil Mickelson…well, I called it. Can he keep it on the fairway? Mostly not. His drives were all over the place. And STILL he was able to recuperate from hill and dale and still pull off a round of one under 69. Just imagine what he could do hitting fairways once in a while! Justin Rose was a surprise leader, but not that big a surprise. Scott Piercy, for me, was out of nowhere. You’ve also got the likes of Steve Striker, Hunter Mahan, Adam Scott, Brant Snedeker and Zach Johnson also hovering there around two under, and there’s still a lot of golf to be played. Today’s notable tee times: Rory McIlroy and Phil Mickelson, 12:45 EST. Tiger Woods and Justin Rose, 2:05 PM EST. Jim Furyk and Bubba Watson, 1:05 PM EST. And Ernie Els, Lee Westwood, 11:55 AM EST. I haven’t written about golf in upwards of a week, so as we approach the start of the TOUR Championship (sponsored by my favorite soft drink of all time, Coca-Cola) at Atlanta East Lake, I thought I’d share my thoughts in advance of the first tee time. The first thing I’ll say is Rory McIlroy. The guy’s just been a golf phenom this year, and yes, he’s had his ups and downs. But he’s had more ups than downs of late, taking the last two tournaments and breaking from the field for the PGA Championship at Kiawah. Can he win three PGA Tour victories in a row? If all facets of his game are on when he tees it up tomorrow, absolutely. But if Uninvincible Rory doesn’t show up, it breaks the field wide open. To wit, enter Tiger Woods. He comes into Eastlake ranked # 2 behind Rory, but if Tiger can turn his putter back on, and stay consistent with the rest of his game, there’s no reason he couldn’t walk away from this golf feast with another FedExCup. Tiger and Rory play together in tomorrow’s round. Beyond that, we can’t forget Phil Mickelson. He, too, was struggling with his putting this year, but the claw grip seems to be mostly working for him on the comeback. If anything, Phil will have to have some discipline off the tees and not always be consumed with distance. East Lake is lined with tall pretty trees that you never want to see your golf ball get behind, so accuracy counts. That includes for you, too, Phil. But I’m also keeping my eye on Brent Snedeker. Never mind, the guy hits the ball faster than any golfer on tour. “No Yips Snedeker,” he should be called. I want to take his putting and bottle it up and sell it at public courses everywhere, and with East Lake’s smooth Bermuda greens, and his cavalier hybrid play, Snedeker can not only attack the pins — he can sink the putts where he gets close. If Snedeker gets an early lead, he’s going to have to buckle down and not allow bad course management (or fear) get in his way. And then there’s also the looming South African, Louis Oosthuizen. Louis still has one of the most beautiful swings in golf, and his calm demeanor will be an advantage with the stakes being so high. He’s had three top fives in his last five starts, so it’s not unimaginable for his consistent play to sneak up the leaderboard to win the TOUR Championship. Of course, that’s just five of an excellent field of 30 pro golfers from around the world who will be playing in the TOUR Championship at East Lake — playing to win, and rehearsing for what I consider to be the real main event, next week’s Ryder Cup!